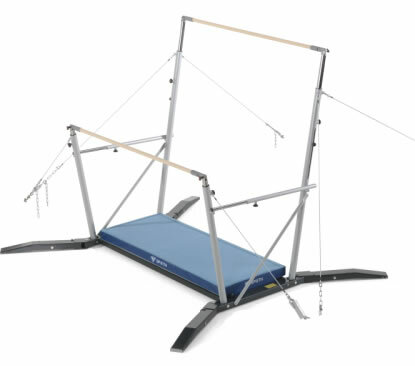 This radical new design of freestanding uneven bars from Spieth results in a set of uneven bars that are extremely stable and suitable for virtually any exercise. The bars meet all dimensional norms specified by the FIG for uneven bars. The bars are perfect for clubs in leisure centres where bars have to be taken in and out of storage for use. The integral wheels enable the bars to be wheeled easily and quickly, and once the feet are extended the unit is extremely stable. The bars are supplied unassembled in a wooden crate measuring 255x132x36 cm for straightforward self-assembly. If this does not fit through the door, it will be delivered outside. Total weight 306 kg. If you need these bars because you don't currently have floor anchors then you can still use these bars in the future - the bars are compatible with a standard set of Spieth cables and tension clamp so you can use the bars floor anchored in the future. 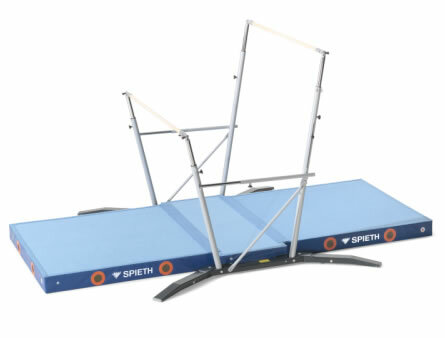 SPIETH - Frame mat for freestanding uneven bars "Club"
Mat set for Freestanding Uneven Bars "Club"